Mary Anne Zuber, 70 of Oswego passed away Friday at Upstate Medical University Hospital. She was born in Oswego and was the daughter of the late David J. and Mary Ellen O’Neil. Mary Anne was the wife of Robert A. Zuber. Mrs. Zuber was a graduate of St. Joseph’s Hospital School of Nursing in Syracuse. After graduation she was employed for several years as a Registered Nurse with the Oswego Hospital, Pontiac Nursing Home and the Oswego County Health Department. She was a member and Past President of the Columbiettes, a member of the Friends of Fort Ontario, an artisan with the Country Folk Art shows and member of the Ladies Ancient Order of Hibernians. She and her family owned and operated “Grandma’s Trunk” gift shop in Oswego for many years. She was a communicant of St. Peter’s Church. In addition to her husband, she is survived by, one son Robert Alan (Cindy) Zuber, Jr. of Oswego, one daughter Jennifer Anne (Walter Bozek) Zuber-Bozek of Oswego, one sister Nancy Elizabeth (Karl) Slobe of Scriba, two grandchildren, Brian Patrick Zuber and Harrison Robert Zuber and several nieces and nephews. Funeral services will be held at 11:00AM on Tuesday April 16th in St. Peter’s Church. Burial will be in St. Peter’s Cemetery. 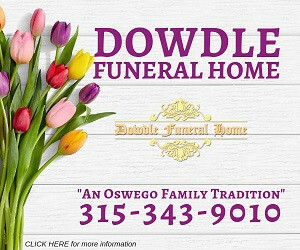 Calling hours are Monday April 15th, from 4-7PM at the Dain-Cullinan Funeral Home, East 2nd St. in Oswego.